Kenrich’s heavy duty grout pumps provide outstanding performance in a wide range of pumping applications. 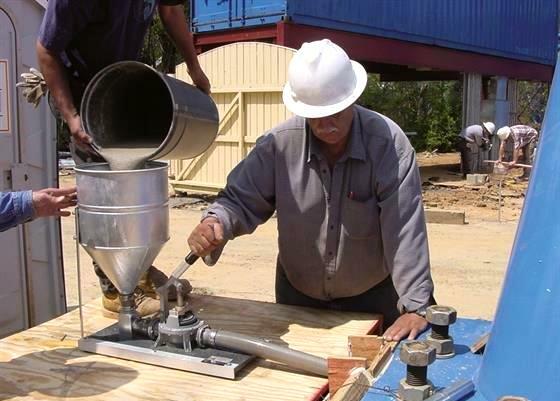 In addition to pumping Cementitious grouts, our heavy duty pumps will pump any material or mixture that is thin enough to be drawn from the hopper into the pump without separating. Most metal door frames and window frames in commercial and municipal buildings must be pumped full of grout. Filling door and window frames with grout serves two purposes: first, it helps anchor the frames to the walls around them, making them sturdier and more secure; second, it is essential to maintaining a fireproof rating. In this process, the output tube of a grout pump is inserted into a cored hole on one side of the door or window frame and grout is pumped in. The grout free falls to the bottom, gradually filling the frame beyond the point of ingress and continuing up and over the top of the frame. The tube is then inserted in a cored hole on the other side of the frame and the process is repeated until the frame is entirely full. Any Kenrich grout pump can be used to grout metal door and window frames. The manually-operated GP-2 is our most popular model for this application, thanks to its versatility and ease of use. With two output tubes, the GP-7 provides fast and efficient grouting for door frames by filling both sides of the door frame simultaneously. 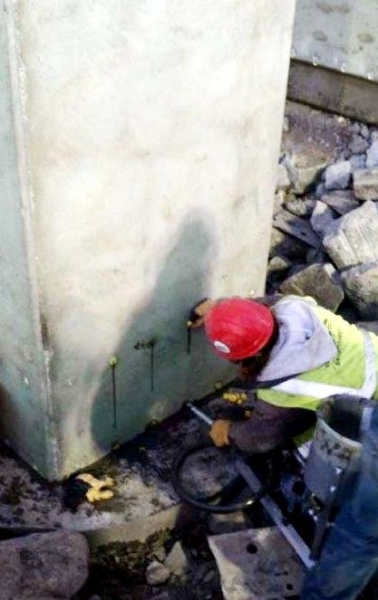 Some commercial construction uses hollow concrete blocks (a.k.a. cinder blocks, breeze blocks, or CMU blocks/CMUs), and all structures built in this way require that the spaces between wall sections (where walls intersect) be filled with grout. In most cases, it is also required that 2-3 courses of concrete block on all sides of any door or window be filled with grout for added security and structural strength. Some construction projects require that all hollow concrete blocks be completely filled, floor to ceiling and wall to wall. Kenrich Products’ heavy duty grout pumps are ideal for filling cinder blocks with grout. They are small enough to fit into relatively small spaces and light enough to be hoisted up onto scaffolding and elevated platforms to reach upper levels. Manual or pneumatic operation makes pumping grout easy in any location. “General void-filling” is a catchall term for any application that requires a solid fill with no hollow spots and doesn’t require high pressure. Common general void fill operations include pumping grout around manhole cover rings and under sidewalks to prevent settling or sinking. Our low-pressure heavy duty grout pumps produce roughly 15 lbs. of pressure per square inch. Kenrich Products grout pumps are also versatile and portable. They're the perfect solution for general void filling operations. A machine bed plate is, generally, a thick metal plate that goes underneath a piece of precision machinery to provide a stable, level surface. This bed plate must be carefully installed and leveled to ensure proper calibration and operation of the machine itself—most high precision equipment cannot tolerate being out of level. Once the bed plate is in place and leveled, grout is pumped in under the plate to fill any open space(s) between the plate and the floor of the facility. Even a small void beneath the machine bed plate may lead to undue vibration and shifting of the surface, which will throw the machine off level. A 100% grout fill is the best and most effective way to prevent vibration, shifting, etc. Kenrich heavy duty grout pumps are ideal for pumping grout under machine bed plates. They are small and light enough to maneuver into various locations on and around a bed plate, to ensure a complete fill. Our hand-operated models can be used almost anywhere, even if no electricity or air power is available. Tilt-up panels are a popular option for building construction. 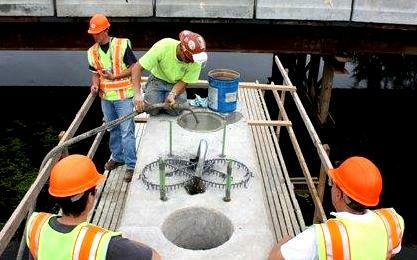 These pre-poured concrete walls are fit into place in grooves in the foundation of the structure to form walls. The joints at the base of tilt-up is then pumped full of grout to help secure the panels in place and to waterproof the joints. Based on the layout of the building, these joints can vary greatly in size and shape, and there can be any number of joints in a single structure. Our heavy duty grout pumps are small and light, making it easy to move them to wherever they’re needed in the building to fill tilt-up panel joints. Manual- and pneumatically-powered models provide fast and easy operation in any location. Kenrich grout pumps can be used to pump a variety of grouts and other cementitious materials. Click here to learn more about flow rates and the types of grouts that can be moved with a Kenrich pump. Or call us at 501-281-6190 for answers to your specific questions. The Kenrich heavy-duty grout pumps should last for years into the future, depending on the usage, material that you are pumping and regular maintenance.With proper care, many customers report their Kenrich pumps working in the field for 20 plus years. The life of your pumps will depend on its maintenance and the cleaning of it after every use. Both at the end of the day or after an extended time of not using it. Do not let any grout dry or set up in the pump. Just flush the pump out with water after using, no cleaners or chemicals needed. The most common replacement parts are the diaphragm and flapper valves, which are what comes in contact with the grout inside your pump. Depending on maintenance and the coarseness of the grout, you should be able to pump several hundred bags of grout through your pump, before having to replace your diagram and flapper valves. If you have any questions about using Kenrich heavy duty grout pumps for these or any other applications, call us at 503-281-6190 or complete our contact form for more information.